Kathy Faul feels a alabaster stone, outside the Stone Room in the Pennsylvania Academy of the Fine Arts School on Saturday, June 9, 2018. Faul is a blind sculptor and a PAFA continuing education student. Faul is currently hoping to make an Egyptian cat for her daughter. The project can take two-years. Kathy Faul's first sculpture class required her and her fellow students to create a terra-cotta statue based on a live male model. She called the model over. "I said, 'Can I touch you?' and he said, 'Oh, sure,' " Faul, 72, said. "Then the professor walked in and screamed, 'Nooooooo!' "
It is through touch that Faul sees the world. She is blind, having lost her sight in a serious car accident when she was 21. Yet even with that challenge, she is an accomplished sculptor, currently crafting works in stone at home and at the Pennsylvania Academy of the Fine Arts with associate professor Steven Nocella. In March, her sculpture of a mother elephant with child won an honorable mention in the continuing education programs annual student exhibition. "I'm always impressed by what she does," said Nocella, who has worked with Faul for 18 years. "Her works are necessarily simplified in terms of the form but at the same time she is able to find the complexity in it. I'm amazed at her diligence and how she challenges herself." Faul, who lives in Swarthmore, doesn't think of herself as handicapped. When an art scholarship application form asked her to list her special needs, she wrote that she had none. "I thought they meant do I need a lift or something like that," she said. "I didn't realize it was the politically correct way of saying, 'What is your handicap?' Or, 'What is your disability?'" Faul wasn't always at peace with her blindness. She was a senior at Beaver College – now Arcadia University – on Halloween night in 1966. She was the passenger in a car that hit a small tree. Her face smashed into the dashboard. She was in and out of consciousness for three weeks. "In the beginning, I wished I'd died in the accident," she said. "I lost my eyesight and I lost my face. I don't even know what I look like." Kathy Faul works on her sculpture with her service dog, Patch, outside the Stone Room at the Pennsylvania Academy of the Fine Arts. But Faul was a strong woman from a long line of strong women – her great-grandmother was 5 when she traveled alone on a ship from Sweden to the United States; a sign around her neck bore the New York address where her mother and sister were living. "My mother was so essential in getting me to stand up on my own," Faul said. "She said that if I wanted breakfast or lunch, I had to make it myself." Faul learned braille and got a Seeing Eye dog. She went back to college, listening to her textbooks read by volunteers on a reel-to-reel audio player. After graduating, Faul went to a computer programming school in Pittsburgh. There, she met her future husband, who died in 2011. They married and settled in Swarthmore. Faul took a job as a computer programmer at a bank, printing her programs in braille. "People said, 'You can't have children' and I said, 'Why not?' I thought I could do it," she said. Son Bradley was born in 1974. Daughter Kimberly followed about four years later. Kim Faul said she never realized her mother couldn't see until she was about 5 and her mother missed the ball Kim had tossed to her. "I grew up in very similar fashion as parents who could see," Kim Faul said. "My mother just had this way of being able to figure out her world without the use of sight." As a child, Kim Faul wore shoes with small bells attached so her mother could track her movements. One day, Kim took a tumble down the basement stairs. Kathy Faul, who was already downstairs, heard it happening. "She rushed over and by the grace of God caught me before I hit the concrete," said Kim Faul, 39. "She says a guardian angel guided me to her arms, but it was her." Kathy Faul began dabbling with pottery in 1984 as a way to deal with grief after the death of her mother. In 1993, Faul was diagnosed with breast cancer and she again turned to art to cope. She began sculpting, first in terra-cotta and then in stone. She remembers her first class with Nocella and how he guided her to her stone and placed her fingers carefully on the hammer and chisel. 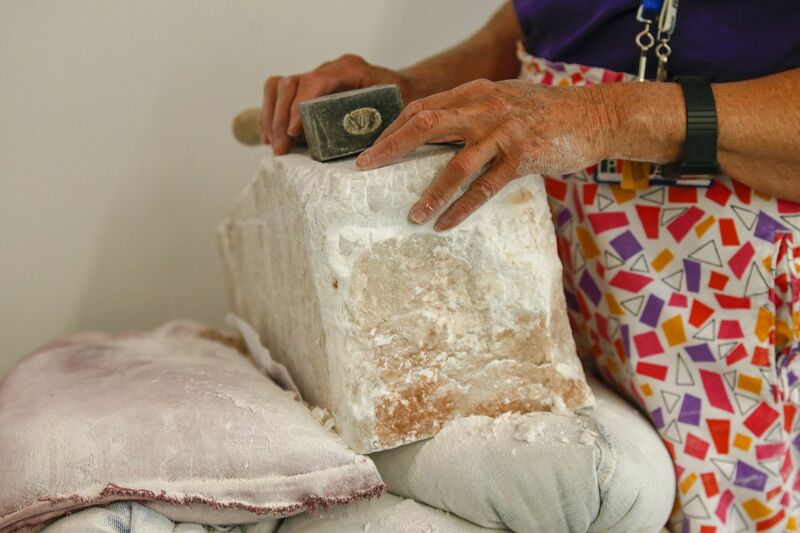 "Stone carving is probably the best medium for someone who can't see because it lends itself to tactility and touch," Nocella said. "Kathy's teaching me to see things differently." To create her forms, she finds models that are already done and feels her way into creating her own work. On a recent Saturday morning, Faul ran her hand over a chunk of alabaster she was beginning to rough out. Patch, her dog, lay at her feet. Faul was carving an Egyptian-style cat, a piece she predicts will take at least a year. For four weeks, she's been chipping the cat's arched back. The cat is for Kim. Stone sculpture, Faul said, is a way to "inner peace." "With each contact with the chisel, a small piece of stone about the size of a grain of rice falls away," Faul said. "Weeks go by, one chip after another, until, voila! The piece of sculpture that you have been looking for is there, inside a ragged façade of stone." And it all began with that first terra-cotta sculpture class and the model who allowed the budding artist to feel the hills and valleys of his body. "I didn't feel that far," she said with a giggle. "But I did touch his hip and it didn't have anything on it."